Rumba Tables, Fixed Post Leg Table with Casters, 60 x 24'' Cherry Tabletop & Black Base by Safco at Momiji Studios. MPN: 2090CYBL. Hurry! Limited time offer. Offer valid only while supplies last. 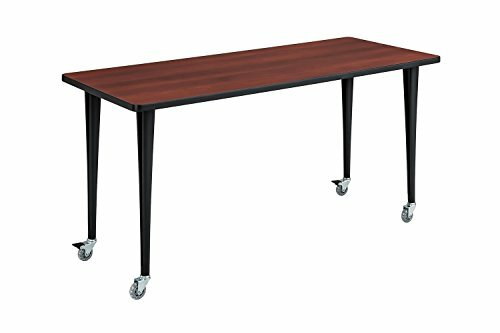 The RumbaTM Post-Leg Table with casters offers a simple, adaptive design that's easy to arrange for a variety of office space needs. Made of 1in. The RumbaTM Post-Leg Table with casters offers a simple, adaptive design that's easy to arrange for a variety of office space needs. Made of 1in. high-pressure laminate with protective 3mm vinyl t-molded edging, the durable rectangular tabletop sits on a sturdy cast aluminum base with 4 skate-wheel casters (2 locking) for smooth mobility. An optional Black Modesty Panel (Model# 2060BL, sold separately) can be added for privacy. An optional Ganging Connector, Model# 2060BL (Item# 62201, sold separately) secures tables together while an optional Clamp-On Power Module provides 3 grounded outlets and 2 Ethernet data connections, Model# 2059BL (Item#62200, sold separately).